The defeat of terrorism in Sri Lanka under the leadership of President Mahinda Rajapaksa was both admirable and commendable, as well as an example to other countries facing this threat to freedom today, said the Bahrain Prime Minister Shaikh Khalifa Bin Salman Al-Khalifa at the meeting with President Mahinda Rajapaksa at the Presidential Secretariat, today, July 29. 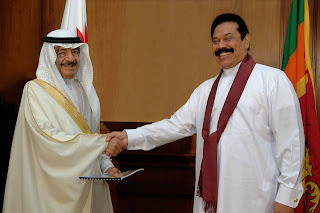 The Prime Minister of Bahrain made these observations when President Mahinda Rajapaksa apprised him of the situation in Sri Lanka after the defeat of terrorism and current steps being taken to resettle and rehabilitate more than 280000 persons internally displaced following the humanitarian military operations to defeat terrorism. President Rajapaksa described the many steps being taken by the Sri Lankan government, together with United Nations and international relief organizations, to expedite the resettlement and rehabilitation of the IDPs, and the massive reconstruction work involved in this process. He said the government was working to a plan to resettle these people expeditiously and also provide them with suitable livelihood opportunities. The Prime Minister of Bahrain appreciated the work being done for resettlement of the IDPs and the manner in which the government of Sri Lanka was proceeding with reconstruction in a large area of the country, destroyed by terrorism. He said that Bahrain would have discussions with other countries of the region as well as the larger world community to keep them informed of the commendable work being done by Sri Lanka and the need to give assistance to Sri Lanka for this purpose.